OnePlus have at last issued the Open Beta for Nougat, Android 7.0. This is a beta test version. Beta means that there may be issues with the release. This release is for OnePlus 3, A3000 & A3003, only. This build will not OTA to current open beta users. You can download the build here:"
OxygenOS Open Beta 8 See post #4, below. After upgrading to Android N, you will not be able to directly downgrade back to M builds. Our customer service team has a special build of Android M that will allow you to downgrade, but this will format your device. If you'd like to flash back to M, please contact Customer Support. Please keep in mind that this is beta software. This build will not be as stable as our official OTA releases. Given that this is a shift to a brand new version of Android, there may be more bugs in this build than previous Open Beta builds. By installing this update, you accept the potential risks." Please read, carefully and thoroughly, all installation instructions in the thread. DO NOT attempt to use TWRP custom recovery to flash this firmware. 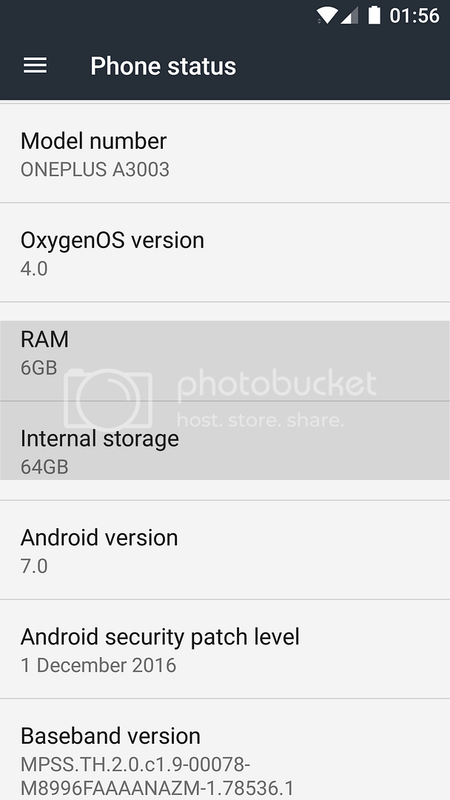 The f2fs file system, as used on the OnePlus 3T model, now replaces the ext4 system. OnePlus have now closed the download link for Open Beta 8, Nougat, firmware for the OnePlus 3, that is shown in post #1. "***EDIT: We have disabled the download link as we have gathered enough feedback, thank you for your support. ***"
which smartphone is better for gamers, selfie and watching videos?